painting outdoors or supporters that want to stay close to the group. 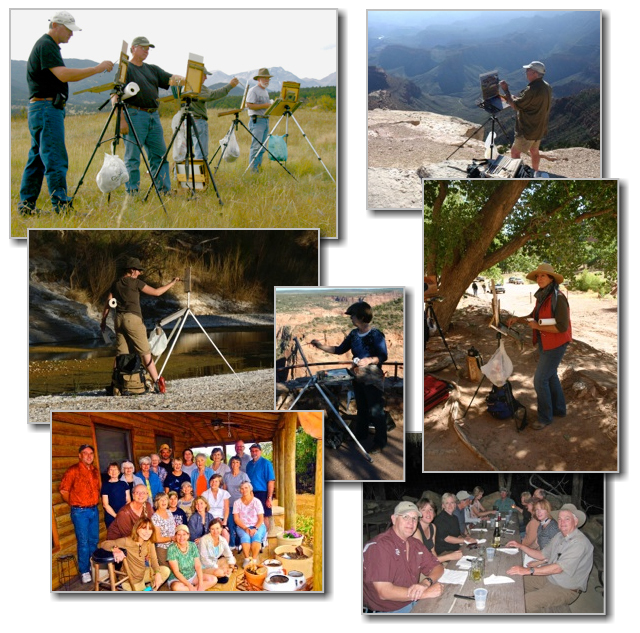 We promote the tradition of Plein Air painting and our paint outs provide opportunities for emerging artists to socialize and even learn from profesionals. About 75% of OPS reside in Texas, Oklahoma, Arkansas, Louisiana, New Mexico, Arizona & Colorado, but our membership is "without borders" with members from all across the country from the eastern seaboard to the west coast. We organize 9 or 10 paint outs a year and paint together with the outings ranging from 1 day or as long as a week. We paint all around Texas from the panhandle to the gulf coast, the Hill Country, various botanical gardens and arboretums -- even indoors during the especially hot months summer or the cold months of January and February. In the fall we sometimes travel to the mountains of New Mexico or Colorado. We've painted the Grand Canyon, Rocky Mountain National Park, Big Bend National Park, Palo Duro Canyon in the Texas Panhandle and several places in Arizona, as well. We produce a newsletter - Plein Talk - that informs members about upcoming outings, exhibitions to see, competitions to enter, recent accomplishments of members, etc. It also helps those who can't make many outings feel a part of the group. Occasionally we'll arrange for a well-known artist to provide a demonstration for us at one of our get-togethers. Members also have access to a lending library of art instruction DVD's and videos by major artists for our members' education and enjoyment. Our web site has other special "members only" forums that help us communicate and share. 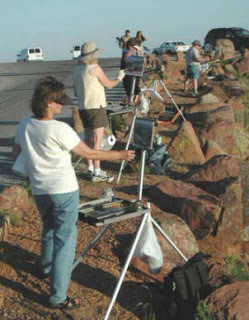 We host a premier plein air painting juried "members only" event known as Plein Air Southwest that attracts national attention, elite artists and is promoted in major art magazines. Click on the PASW tab for more information. We also have an annual online Associate Member Showcase that provides exposure within the group and awards. There is never any "pressure" from within the group - we welcome all skill levels. With any worth while activity, you get out what you put in, and participating in the group paint outs will hopefully promote your skills within the art community..... but better than that, you'll make real friends that share common interests and the love of art. bar at the top of the page. the generosity and heartfelt efforts of all the members who graciously give their time and energy to make our shows and paint outs such a great success.